I was contacted recently by Chairish an online marketplace for vintage furniture. They asked for me to create a style board around an accent chair and take the room from white to bright! Well I'm always up for a good challenge. So I got to work. They sent me pictures of a collection of their beautiful vintage chairs Vintage Accent Chair Collection all very colorful and I had to choose one. On to that in a minute. But first here's a little background on this exciting company. Fun right? Head on over and check them out today! Tell them The Daily Nest sent you! Using all items from Chairish I decided that I would go a little dramatic with a flair from old Hollywood. Using a yellow, gold, and black theme. Quite a different take on how I would normally decorate! I chose these Yellow Hollywood Regency Chairs Chairish Vintage Accent Chairs. From there I chose this sleek sectional that has a retro vibe. To give the room texture I added this reindeer hide. That's right reindeer hide!! Sorry Rudolph! Next to give the room some bling and a throwback to old Hollywood or maybe even new (?) I chose this beautiful gold bar cart with bar accessories. To tie in the gold accents I chose this gold Hollywood Regency coffee table. For the black accents I chose these exquisite black lacquer Georgian mirrors, the black and white regency side table with a pair of Italian handcrafted ceramic lamps, and the 1950 vintage French black chandelier is a statement piece in itself. 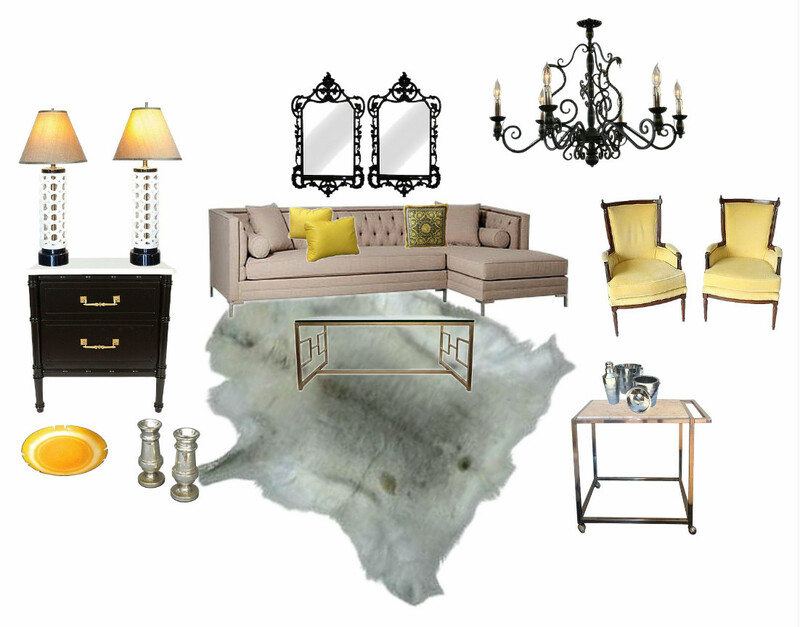 A few accessories such as this yellow plate and mercury glass candlesticks are just an added bonus. If you haven't checked out Chairish you really need to!